TD Ameritrade (TDA) should indeed merge with E*Trade if only to obtain some useful California mortgage exposure. Shoot, the bad taste of the $111m in bad loans E*Trade reported last time around can only fade with time - just lie back and think of the revenue diversification. Jana Partners and SAC Capital know a good thing when they see it; and what's good for them is surely good for shareholders. However, as a mere holder of a United States TDA account the scribe has more prosaic concerns about its mastery of core operations than with whom it jumps into bed next. Premium discount brokers must be more than mere cheap fillers. Their service must be sound; and client accounting bullet proof. "Our system shows that we do not have a W-8BEN on file for you, which is why you see the foreign tax withholding posted to your account. The W-8BEN is an IRS form that is required for Foreign Tax Status customers." “We apologize for the confusion. We do have a valid Form W-8BEN on file for your account. TDA are the third largest US broker with, presumably, the third highest number of foreigner-owned accounts. Think this client subset ought to be worried about TDA's tax knowledge? Good luck to Jana and SAC: the scribe is already considering other brokers (suggestions welcome) as he expects the hedgies, whatever the outcome of their current campaign, are too. UPDATE: TDA have written since this post asking what can be done to keep the scribe put. 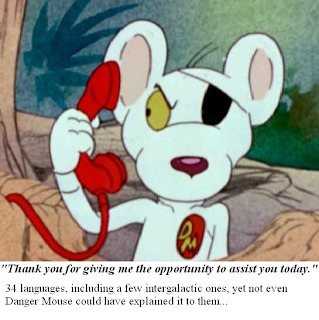 "Phwoor DM....", Are you a Danger Mouse fan too? "Da da da da da da da - he's the best..."